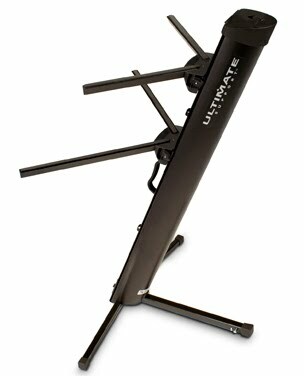 The Ultimate Support's APEX AX-48 Pro keyboard stand is very unique compared to the typical keyboard stands you see. It holds up to two keyboards and has cable channels to tuck your cords away for a clean and sleek look. You can use this in the studio or if you are a live performer you can break this keyboard stand down in seconds and it barley takes up any room because the arms that hold the keyboard fit into the hollow body of the stand making it a carrying case for them. It retails for around $200. For more info visit Ultimate Support here.